When kids are at home, you need to keep your snack bar full at al times. Just before the holidays began we got some snacks from Grand Sweets chennai, sent through my Sister-in-law by my Father-in-law. Thank god for that stash, they had something interesting to eat apart from the cakes and muffins i baked for this Bake-a-thon. 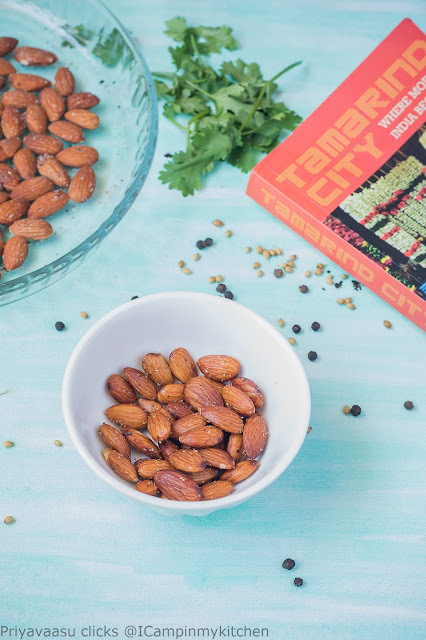 These almonds were baked for one such hungry moment, one of the easiest snack to make and best to munch along with your evening coffee. I love a handful with my evening tea. Even my lil one enjoyed it for his evening snack. Since i was making it for all, i have kept the spice a notch down, if making for adults go on and experiment. Preheat the oven to 200C. In a baking tray or pan, take almonds, add oil, pepper and coriander and mix them all together with your hands. Sprinkle salt on top and mix again. Spread the almonds well. Don't forget to wash your hands after. 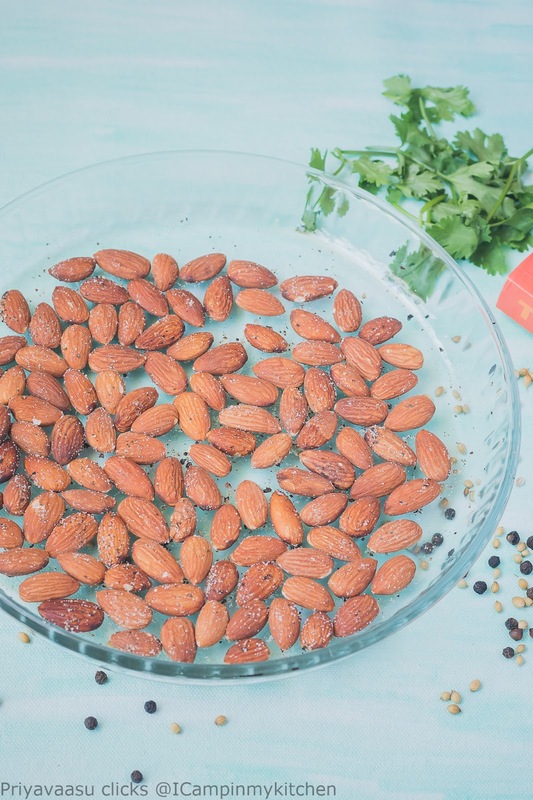 Bake the almonds for 20 minutes in the preheated oven. Once done, remove it and let it cool completely. The cooling part is more important, it takes around 30-40 minutes. 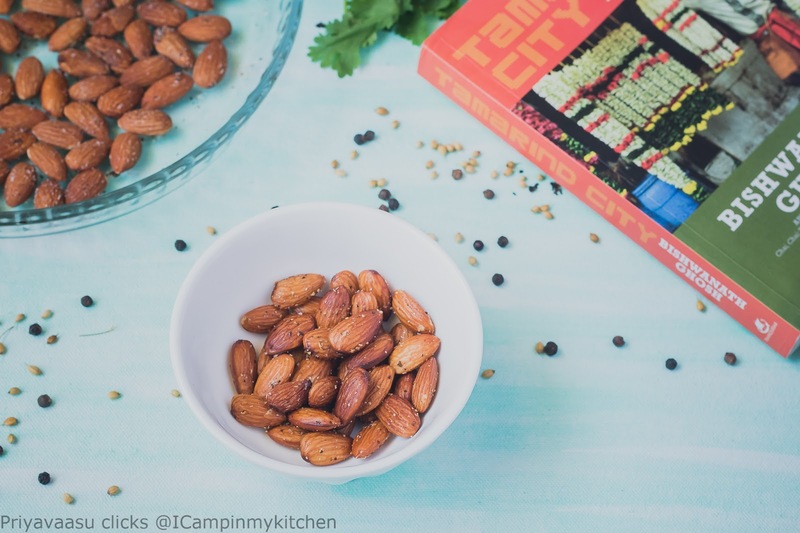 Once cooled, taste the best crunchiest almonds with peppery twist. Store them in an airtight container, if it lasts that longer. Mine got over in a hour and i had to bake another batch for the pictures. So, now i made 2 things for the blog and still haven't clicked them. 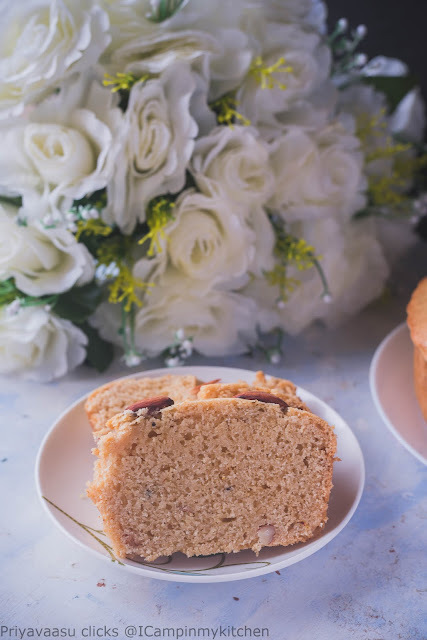 So thank god for this cake in my photos, i could make today's post, since i wanted the last post of Bake-a-thon to be something pretty and i know this cake is somthing more than pretty! A simple chocolate cake filled and frosted with oreo buttercream. The cake and the cream blend so pretty and it was super duper hit with the kids at the party. All i got to click was a messy plate with just one slice left. But i loved it, this is how it should be, gone in seconds! This is my goto recipe for chocolate cake, just like my Vanilla cake with buttermilk, this is one too never dissappoints. Just melt them in the microwave, just before using it on the cake. Preheat the oven to 180C. Grease and lay the pan with parchment. You can use 2 5 inch pans or 1 8 inch pan for this.I made 3 cakes and sliced them into 2 layers each and made them into 2 cakes with 3 layers each. In a large bowl, take together whole wheat flour, cocoa powder, baking powder and baking soda. Whisk them well together. I these days use my whisk to mix it all together. You can also use a sieve to sieve them all together for a homogeneous mix. Add sugar to this and whisk again. In a measuring jug, take buttermilk, add oil and vanilla extract to this and mix well. Now add this liquid ingredient to the dry ingredient. Using a spatuala , mix it together in single direction. Now pour the prepared batter into the pans and bake in the preheated oven for 40-45 minutes or until a toothpick inserted in the centre of the cake comes out clean. 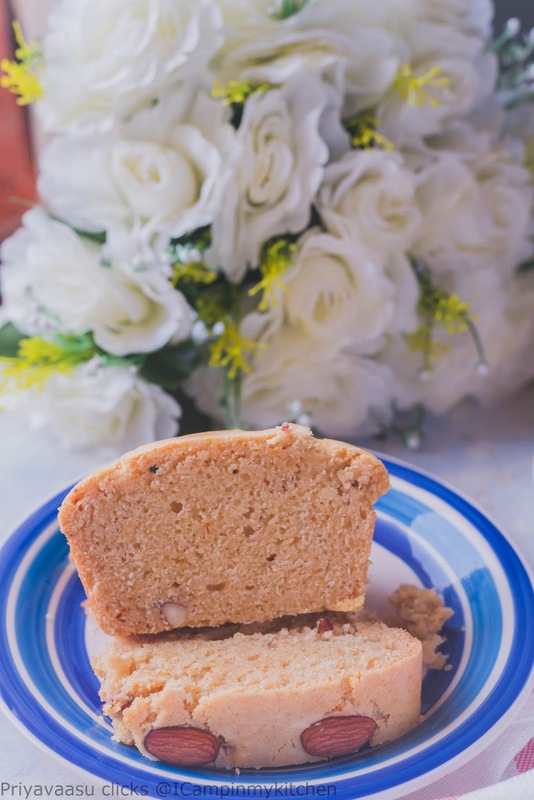 Remove the cake from the oven, let it sit in the pan for 5 minutes, then using a blunt knife loosen the edges of the cake from the pan, and slowly unmould it on a wire rack and let it cool there completely. If serving as such, then slice it warm and serve along with coffee/tea. Since i frosted the cakes for my son's bday party, i allowed them to cool completely and cling wrapped them and refrigerated until neeed. Take the oreo biscuits in a ziploc pouch and pound them well with your rolling pin. Keep them ready by the side. Take butter and whisk it with an electric beater, until light and fluffy. Now add sugar 1 cup at a time and whisk well. Once done, add the pounded oreo biscuits and milk to it and whisk again. The buttercream must be smooth and spreadable, if it is too thick add another tsp of milk to it and whisk. Once done, either frost your cakes, if storing, cling wrap it well and refrigerate. I normally make the cream just before i frost them. Fill and frost the cakes. I have a cake slicer from IKEA. I used it to slice my cakes into two. It is a pretty easy tool to use. Adjust the level of the blades according to the thickness you require and hold hte cake with one hand and slice/saw thru the cake using the other hand. That is how i do it, there might be other ways, do check the youtube for best ways to slice a cake into two using a cake slicer. Refrigerated cakes are easy to slice through. Once sliced into two, let us frost it. Put a blob of frosting on a cake board or a plate. This helps to hold the cake in its place while you frost. Place a cake layer on top. Brush the top with simple sugar syrup.Fill the top of the cake with oreo butter cream frosting. Place the second layer bottom side up. Brush the top again with simple sugar syrup. Refrigerate the cake for atleast 10 minutes before decorating it more. I added another layer of frosting, Drizzled some chocolate on top and piped some more cream on top for holding the mini oreos garnished with some mini oreos and chocolates. 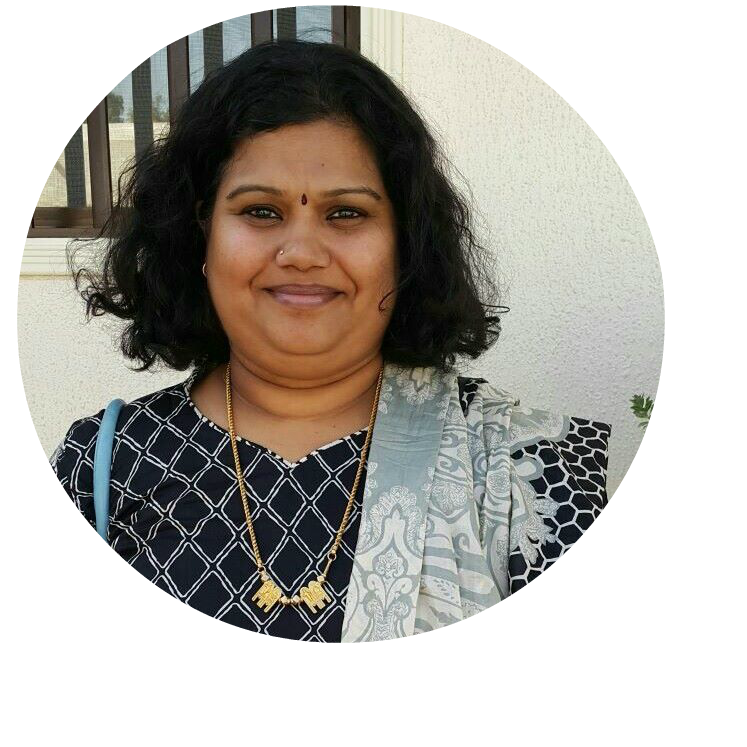 I was not sure whether i would be able to do publish today's post on time, but thankfully here i am! 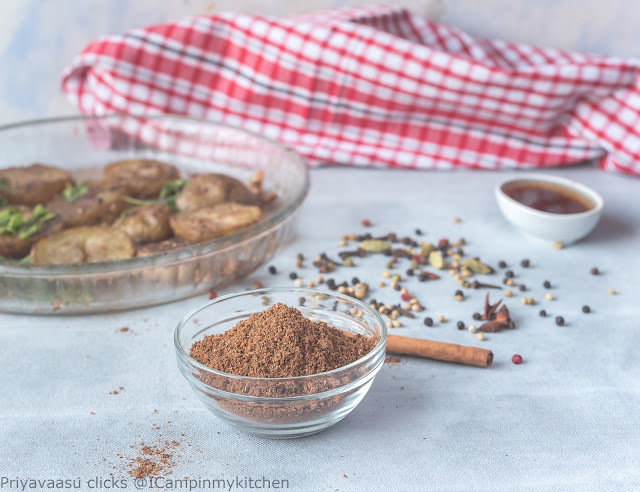 I totally enjoyed this week's moroccon theme, thought we did only 3 simple recipes, but i have bookmarked loads, and i m sure our boss +srivalli jetti will definitely give us this theme again in the coming months. Today's recipe was done in flat 15 minutes. I started around 4:30 pm and i clicked it at 5:00, as my daylight was fading fast, i just propped my board on my cloth dryer and used my phone camera to click these pictures. I m pretty happy with the pictures too. The story above was to state how easy is this recipe. This salad would be a great addition to your party table, if making ahead, just parboil the carrots and keep it refrigerated and on the day of serving, toss it with the seasonning and just before putting it on the table garnish it with nuts and raisins. Do not miss that garnish, those toasted pistachios add a great texture to the salad. 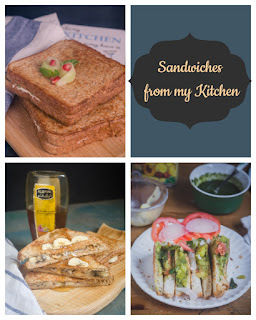 Do try this recipe and let me know how you liked it! Wash and peel the carrots, chop them into chunks, take them in a sauce pan, add water to sumberge the carrots and let it sit on heat until it starts to boil. Once it starts to boil, take it off the heat, drain and set aside until it cools down. While it is cooling, whisk the seasonning together. I had the spice oil from yesterday roasted potatoes, i have used the same. 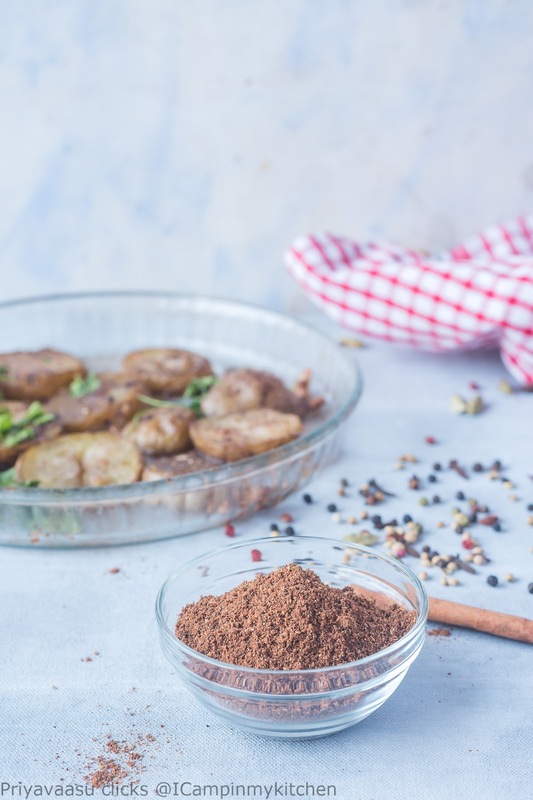 If you dont wish to use ras el hanout, you can mix paprika, cumin and pepper powder together as per you taste and use it for spicing the salad. Once the carrots are cool, take in a salad bowl, add the seasonned oil, lemon juice,salt and toss together. Just before serving, add the toasted pistachios and raisins to the salad and serve. Baked potatoes were in my bucket list and it was fired more when i tasted it at our bloggers meet here at Anamika's house. She had made it so beautifully, picture perfect, delicious balance of flavors and served it with a garlic yogurt dip(hope I m correct ). When we asked for the recipe she said that potatoes were parboiled and baked. 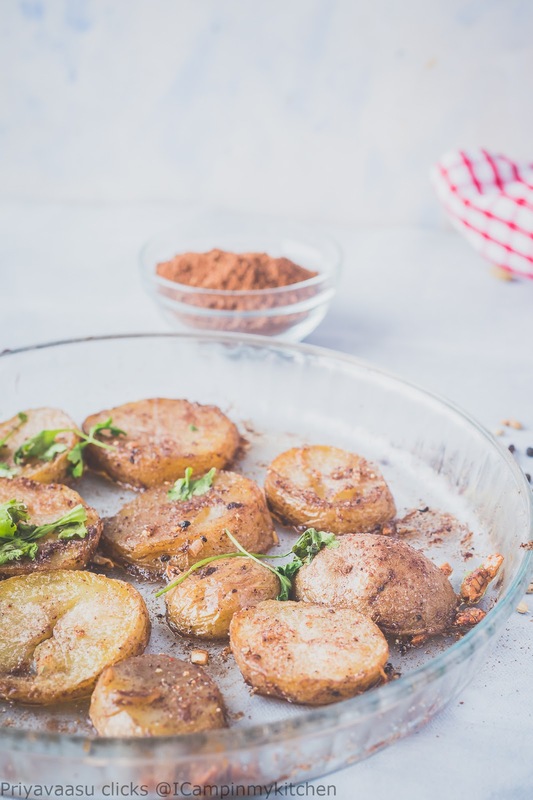 Parboiled potatoes when baked gives a perfect crisp outer and a soft inside. 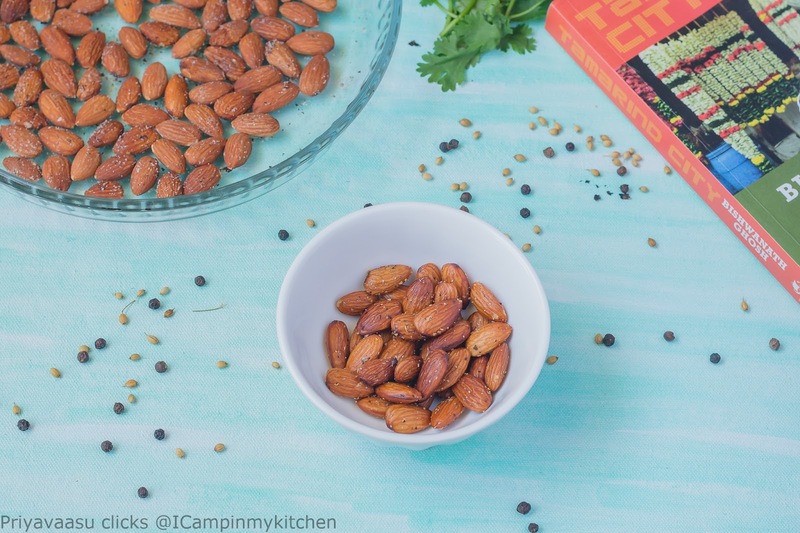 When mixed with spices, they create amazing flavors ! When I made ras el hanout, the first recipe I wanted to make was this baked potatoes! Oh man, what a dish! The flavor of the spice amplifies the taste and it makes a great side on your party table. I m not exaggerating about the taste, my hubby has asked me to make this again so he can relish it better. 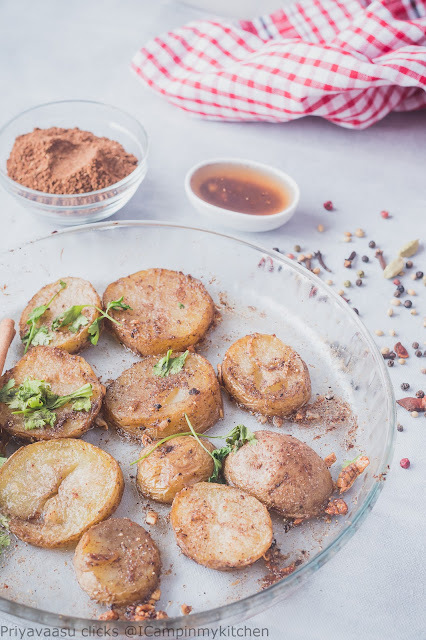 Want to make an impression in your next party, try these yumm potatoes! Wash and scrub the potatoes well. Cut them into thick rounders. Keep the skin on. Minute, take it off the stove. Let this sit for 5 minutes and drain. While the potatoes are parboiling, Take oil in a small bowl, add minced garlic, ras al hanout, pepper/paprika, Mix well. Let this sit for 15 minutes for the flavors to infuse well. In a baking pan,Add The parboiled potatoes, pour the spice oil on top and rub it well with your hands to coat the potatoes well. Bake the potatoes in a preheated oven at 200c for 30 - 40 minutes. Turning it once after 20 minutes. Once done, Remove the potatoes from the oven, serve it warm, with a dip of your choice . Ras el hanout, means head of the shop or top-shelf, it is spice mix, something similar to our Indian garam masala, made with top ingredients of the shop. Don't get intimidated by the long list of ingredients. 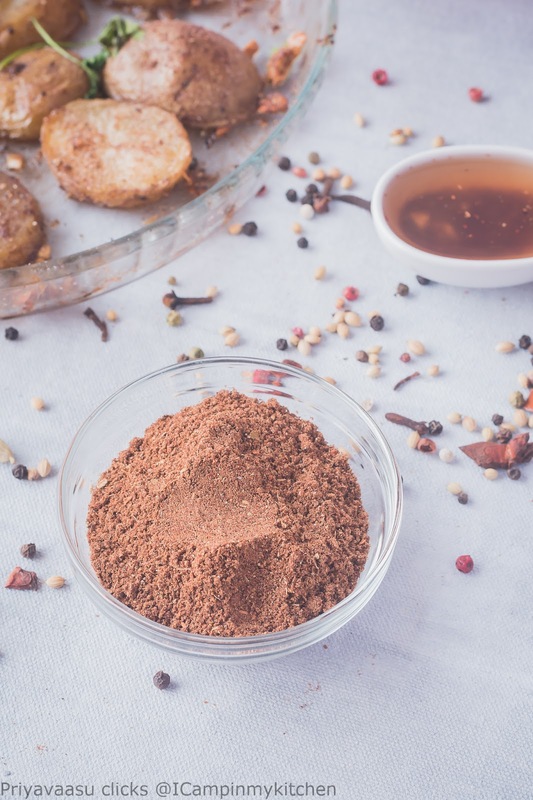 All these can be very easily found in Indian house-hold, and if you are foodie, love experimenting, then definitely these spices will be in your pantry! Once you gathered all these ingredients, just dry roast it and process to fine powder, that's it , tada! 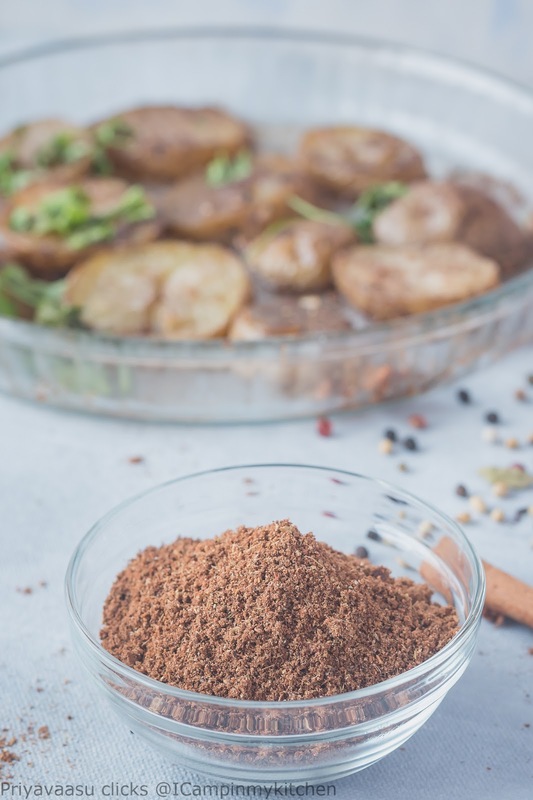 you have an awesome, flavorsome, spice blend to experiment with. I made some roasted potatoes with this new spice mix and oooh, la la, we loved it. I can recreate the same taste in my mind,as i type this. Such unique flavor. While reading about the spice, i came across that every house-hold might have a slightly different mix of spices for their Ras el hanout! But many purists say that it should contain a dozen spices.Apart from the ingredients given here, you can also use galangal, dry ginger, fenugreek, paprika etc! It is called top shelf/shop, meaning the finest of spices. 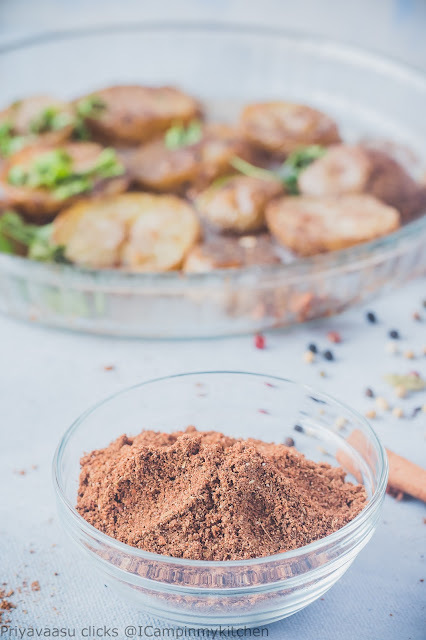 So go ahead, tweak it a bit and use your favorite spice and get yet another exotic Ras el hanout. Take all the ingredients, except rose petals, turmeric, cinnamon and turmeric powder in a wide pan. In a slow flame, roast all the ingredients together. Take care not to burn the spices, keep the flame simmer, and roast. Remove the spices once they are aromatic. Let the spices cool down completely. Take them together in a spice grinder along with rest of the ingredients and grind it to powder. Remove the contents to a air-tight container and store away from sunlight. The spice blend has a good shelf life for years. 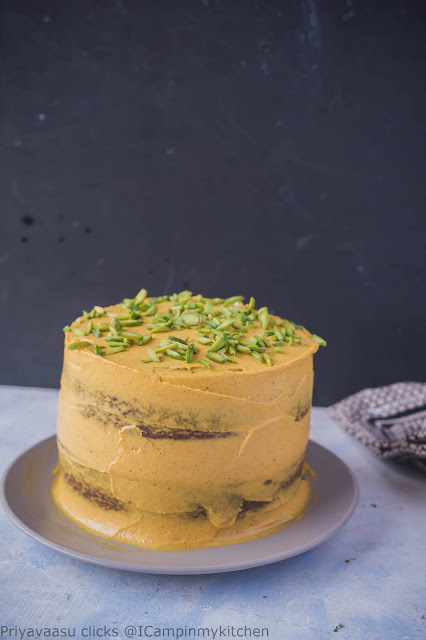 A strong masala chai, is what many need on a wintery evening, once such evenign i got the idea of making this masala chai cake. Since i was making a vegan cake, i wanted a vegan cream to compliment it well. My friends say i make a good saffron tea. 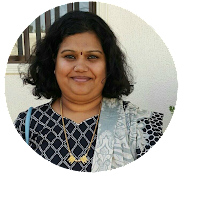 It is a regular during our meet up in my place. So when i made chai cake, i wanted saffron in to it, but instead of adding in the cake i added it to the vegan cream made of cashews and coconut milk. Oh man, that color, that beautiful golden yellow is from saffron, no artificial color added. 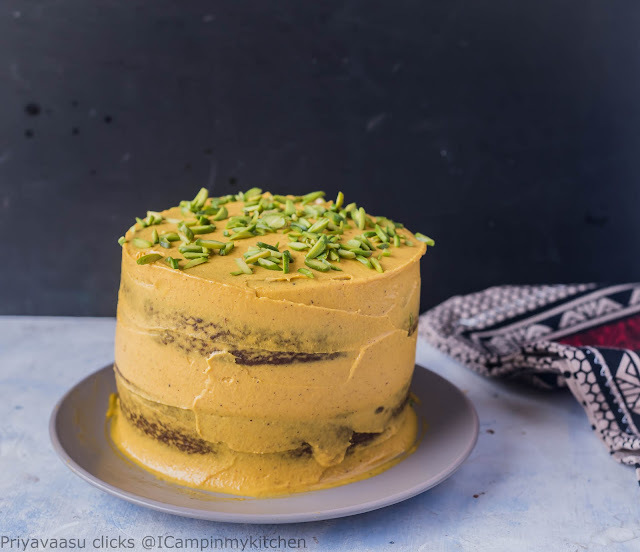 The cake is super hit at home, it has got all the magical flavors of masala chai, so beautifully complimented with golden saffron cashew cream. 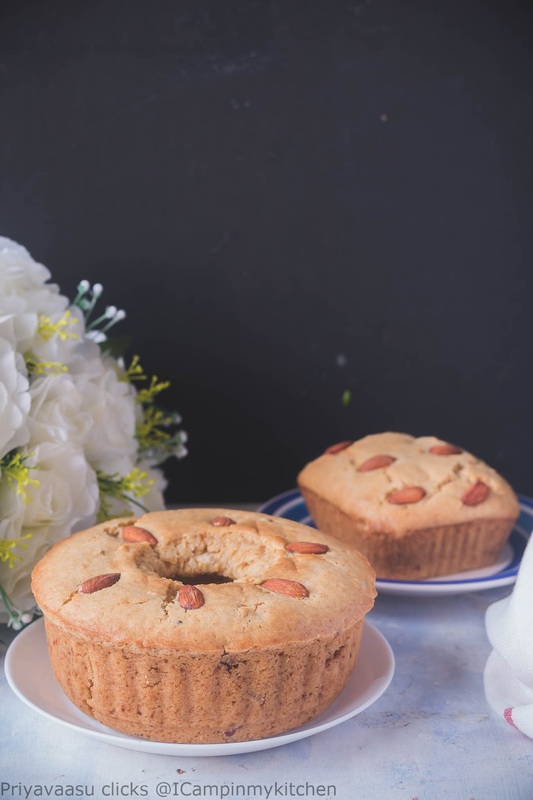 This is a perfect cake to enjoy on a cold evening while lauging your hearts out with your buddies or enjoying a cozy evening with your loved one. 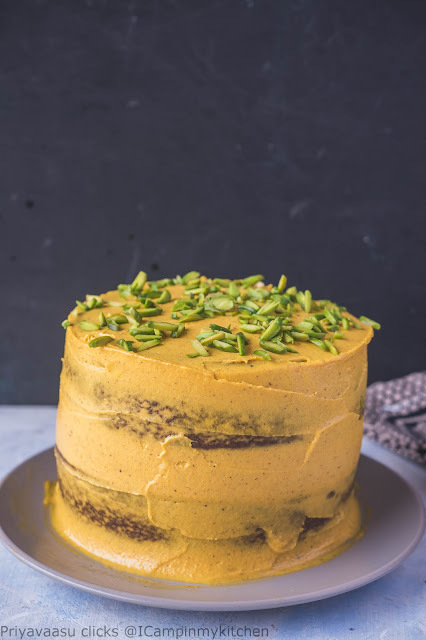 I have made this cake again now, for some better pictures, would update the post soon with some decent pictures, till then enjoy this masala chai cake! Heat 1.5 cups of water, add 2 tbsp of black tea, add the pounded cardamom, pounded cloves and cinnamon to it. Let it boil for 10 minutes, take it off the heat. Let this cool completely. Strain the water and set aside. Let us make the cake. Preheat the oven to 180C. Grease and line 2 5 inch pans or 1 8 inch pan with parchment. Take flour, baking soda and baking powder together in a wide bowl. Add cinnamon, shreded ginger and sugar to this bowl. Whisk it all together. Now In a measuing jug, take the strong black tea, mix oil to it, whisk it well. Add this liquid to the flour mix. Using a spatuala, mix the ingredients together in one direction. Don't mix it vigourosly, be gentle. Remove the cake and let it sit for 5 minutes, then slowly unmould the cake on to a wire rack, let it cool completely. If serving as such, serve it warm with your evening coffee. Since i frosted it with cashew cream, i let it cool well and cling-wrapped the cakes and returned it to the fridge until it was frosted. Make this frosting a day ahead. The frosting needs to thicken, which is possible only when it is refrigerated. Soak cashews in plain water for 6 hours or overnight. Soak saffron in 2 tbsp of hot water. If you need to quicken this process, soak it in hot water for 3 hours. 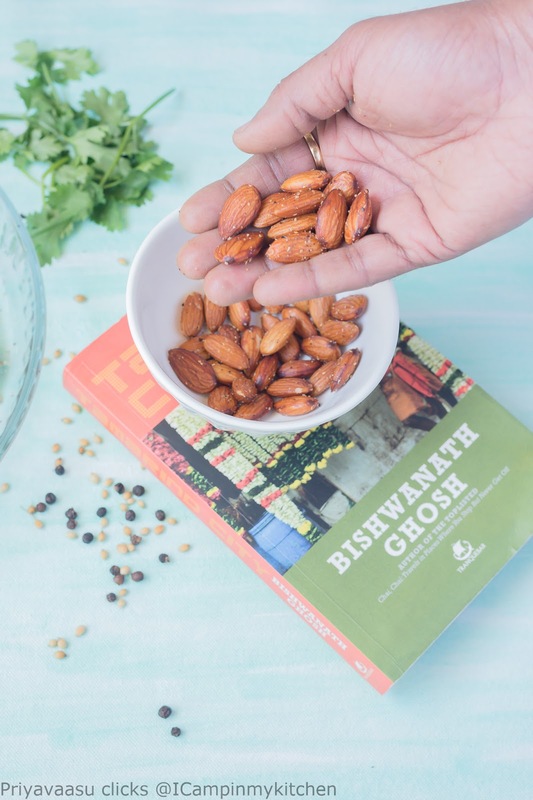 Drain the cashews, take it along with saffron soaked water, coconut milk, sugar in a blender and blend smooth. Remove the cream to an air-tight container and refrigerate. Remove the cake and cashew cream from the refrigerator. Put a blob of cream on to a cake board, place one half the cake, spread 2-3 tbsp of sugar syrup on top. Place 4-5 tbsp of cashew cream on top, smoothen it with a spatuala. Place the second cake on top, spread 2-3 tbsp of sugar syrup on top. Put another 4-5 tbsp of cashew cream and smoothen it using a spatuala. I wanted a naked cake, so i applied a thin layer of cashew cream around the cake. Garnished the top with some chopped pistachios and served. There are some bakes which are there forever in your list and you never get time to bake it. 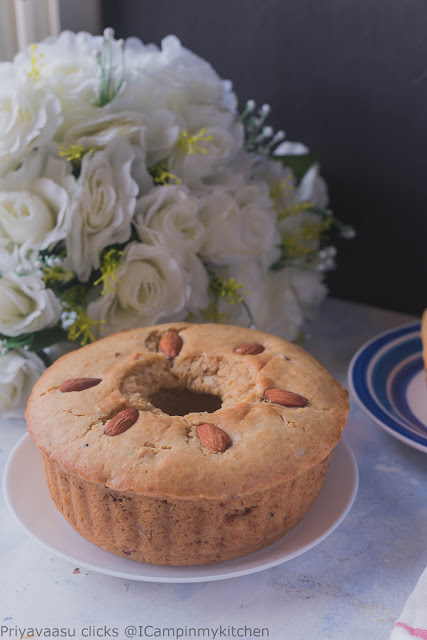 This mawa cake is one such recipe. All these years i never knew the small Gujju eatery near my house sells mawa, this is news to me. 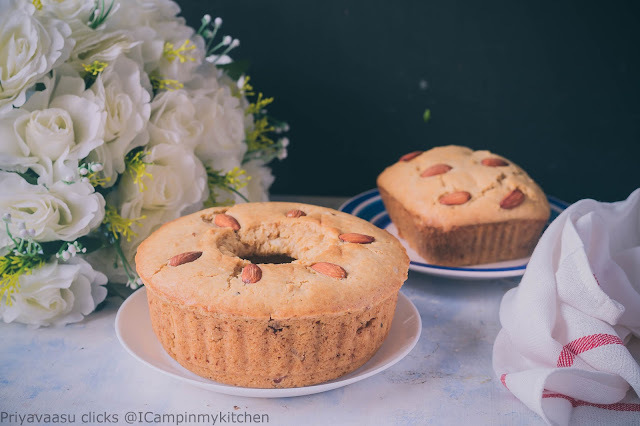 When i was planning for bake-a-thon, i just inserted this mawa cake into the list. Thankfully i remembered the list and successfully made this cake last week. Loved the flavors. The cake is inspired from Dassana Amit's blog. The cake is so rich and aromatic. 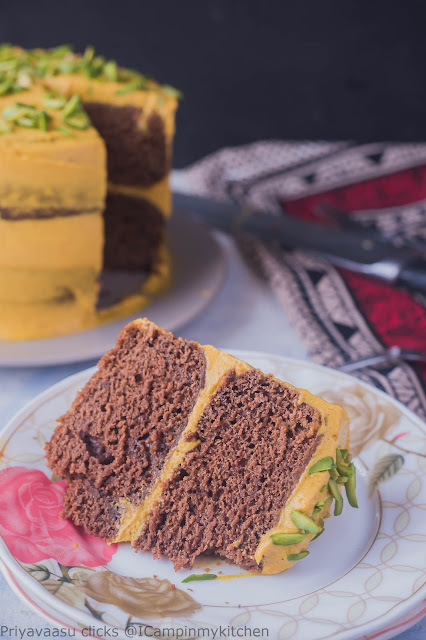 Loved the flavor of mawa/milk solids and the saffron added a royal touch to this already rich cake. 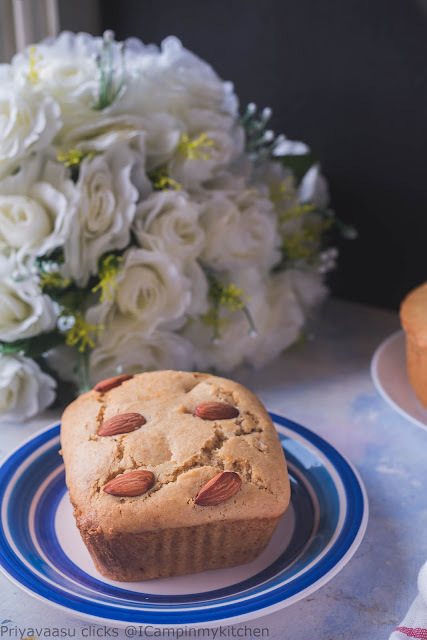 The cake is also in rich in calories, so do make it when you have a crowd at home, who can share the calories with you. Yes, not a joke, if you are in a diet or into clean eating, this cake would definitely spoil what you are doing. So make it on an occassion and share the love. I made it and shared it with my hubby's colleagues, I received lots of love back and they all loved the cake, and requested me to post the recipe soon on the blog. Such cute fellas right!! It is very hard to get friends and family who would enjoy your cooking, so when you are blessed with one such crowd, you should always be thankful, yes i m thankful for all my friends, known and unknown for enjoying my food personally and virtually, it is your love that keeps my camp running! Now christmas is a great time to make this cake, you have lot of people to share, so do try and let me know how you liked it. Preheat the oven to 180C. Grease and line a pan with parchment. I have used 2 pans here, 1 bundt pan and another a take-away aluminum foil container. Will make a one big 7 or 8 inch cake. In a large sauce pan, take milk, add sugar, mawa and butter. Heat until the contents melt and form a liquid. Add saffron and cardamom to this. Do not boil this. We just need to melt the contents. Once done, let this cool and come to room temperature. While the liquid is cooling, in a large bowl, take together wheat flour, baking powder and baking soda. To this flour add nuts and raisins and whisk well to combine. Now slowly pour the liquid contents to this dry flour mix and using a spatuala, mix well to combine. Do not mix vigourously. Be gentle and mix in single direction. Now pour the prepared batter into the pan, arrange the top of the cake with almonds and bake in the preheated oven 40-45 minutes or until done. The cake is done when a tooth pick inserted in the center of thecake comes out clean. Once the cake is done, take it out of the oven, let it cool for 5 minutes, then invert it on a wire rack and let it cool well. Serve it warm with your evening tea. 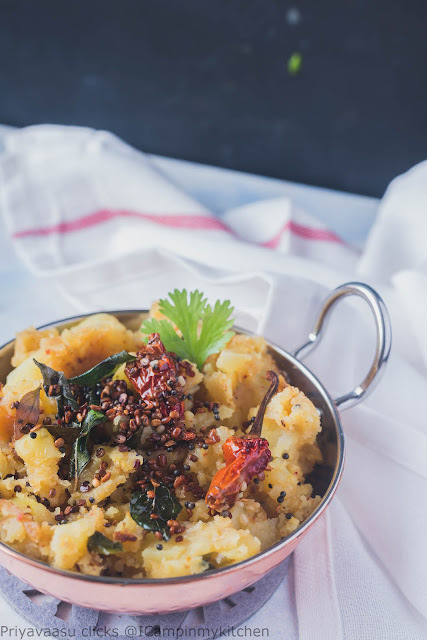 Podimas, a classic mash dish from Southindia. This was the original dish, planned for day 1 post, but then i somehow changed mind and did Beets mash. 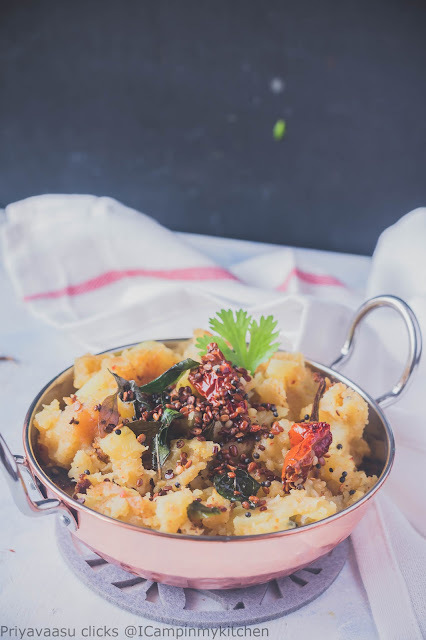 I normally make Vazhaikaai podimas at home, mash with green plantains. 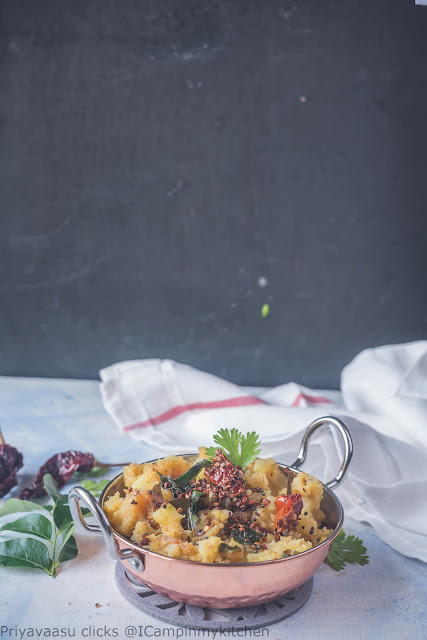 Potato podimas is least favored by kids, they love crispy potatoes or in a gravy, like dubki wale aloo and raswale potato curry. When i made this today, my elder gave a dirty look asking, why did you kill them? 😆 But when i served the same for dinner along with dosa, he loved it. Some dishes need a perfect pairing. I love this podimas with hot hot rasam rice. They just blend with the rice and gives nice texture to the dish,you need to try it to believe it. 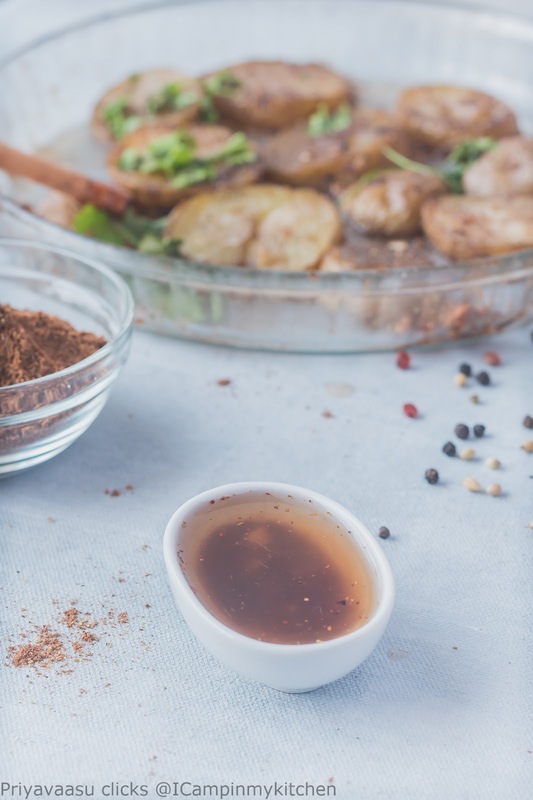 A relatively easy dish, which can be done in flat 15 minutes, all you need is boiled potatoes, it just needs to be seasonned well. Try this and enjoy with rice/roti or your dosa! Wash, peel and chop the potatoes into chunks. Cook them either on stove-top or in the microwave until soft. Once they are cooked, drain and keep aside. In a wide pan, add oil, spluter mustard seeds, add curry leaves, red chili and hing. Next add urad dal and let it turn golden brown. Now add the soft potatoes to this and mash with a potato masher. Add sambar powder, tumeric powder and salt. Mix well. Sprinkle little water, cover and cook for 5 minutes in a simmer flame, for the spices to blend well. Take it off the heat garnish with coriander leaves, and serve warm with rice/roti/dosa.